The United Nations (UN) Peacekeeping Mission in Haiti (MINUSTAH) provided a degree of stability to post-earthquake Haiti. But in late 2010, MINUSTAH brought something else. Nepalese peacekeeping troops arrived to replenish their contingent—but some were infected with the bacteria vibrio cholerae. The troop’s base beside the Artibonite River had substandard sanitation, enabling feces containing vibrio cholerae bacteria to seep into the river. Haiti had no previously reported history of cholera, but the brackish water of the river was an ideal location for the bacteria to thrive. Extreme poverty, millions of displaced living in crowded conditions, poor water and sanitation infrastructure, and a population with no natural immunity ensured that cholera spread quickly in the post-earthquake environment. Out of the approximately 750,000 people who were infected, 10,000 died. Many experts consider these figures to underestimate the true magnitude of the epidemic. Cholera is now endemic in Haiti, and will continue to infect and kill people for years to come. The UN initially denied any link to the outbreak. Yet scientists quickly determined that this particular strain of cholera originated from an ongoing epidemic in Nepal. Initial cases were clustered near the Artibonite River. Journalists proved that sewage from the peacekeeping base contaminated the river, and verified that a new round of peacekeepers had arrived on rotation in October 2010. Journalists pressed the UN and other international organizations to identify the origins of the outbreak, but were told such an investigation would detract from efforts to fight the disease. 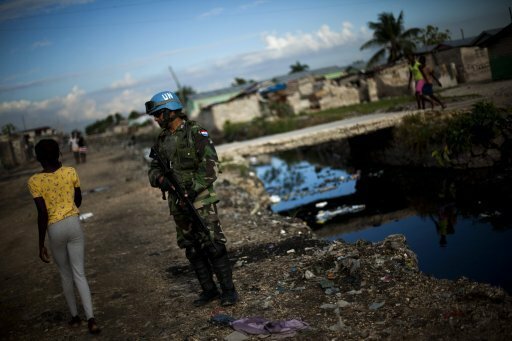 A UN peacekeeper patrols in Port-au-Prince, Haiti, November 2010. An inescapable feature of globalization is the international movement of pathogens and the spread of disease. Global health agreements promote transparency to prevent and mitigate the consequences of infectious disease outbreaks. Under the International Health Regulations, countries must report public health threats and investigate the origins of outbreaks to ensure that others can take appropriate prevention and control measures. Finding “patient zero” not only focuses early efforts, it can provide important lessons to prevent future epidemics. Yet transparency comes with costs. In the international arena, any hint of an infectious disease outbreak affects trade, commerce and tourism. Public health norms imperfectly attempt to mitigate such risks by outlining the conditions for travel advisories and visa restrictions, and obligating international organizations to support outbreak investigation and control. In Haiti, the UN faced similar obligations, as well as risks, in their response to cholera. In Haiti, the UN faced similar obligations, as well as risks, in their response to cholera. The substandard sanitation practices at UN peacekeeping bases clearly violated public health standards. However, their fear of transparency and responsibility was rooted in security concerns. Any link between UN personnel and a disease that caused enormous suffering would put peacekeepers at risk of attack and detract from their efforts to rebuild infrastructure and promote governance in Haiti. Such fears were well founded given Haiti’s complex political and social context, as well as the clear tensions surrounding the role of the international community in post-earthquake governance and aid delivery. The tireless work of human rights organizations, both Haitian and transnational, to hold the UN accountable and advocate for the victims of the outbreak is exemplary. In the face of a leaked and damning report from UN experts, the organization recently acknowledged that they played a role in the epidemic. But given the immunity enjoyed by the UN, efforts to seek reparations or damages in the Haitian and US court systems have so far been unsuccessful. The fight continues on the international stage. In a submission to the United Nations Periodic Human Rights Review process, Haitian human rights advocates argue that given the weakness of the Haitian state, MINUSTAH had a special judicial “personality”. This included obligations to protect Haitian’s right to the highest attainable standard of health, as well as to ensure “remedies” for the victims of the cholera outbreak—namely financial compensation. Safeguarding the immunity of the UN, they argue, violates Haitians fundamental right to a remedy. Acknowledgement by the courts of UN negligence and the harm it caused to the people of Haiti would send an important message. It would remind all organizations working in development, humanitarian and peacekeeping roles that their primary responsibility is to ensure that their actions “do no harm” to recipient populations. The UN’s negligent sanitation practices clearly caused the epidemic and their lack of honesty and transparency complicated and undermined an effective response. These are difficult questions, with no easy answers. Human rights advocates deserve credit for forcing the UN to acknowledge its costly negligence and mistakes. And most importantly, for focusing attention on the rights of the Haitian people.